This story is true…and extremely odd. My name is Dr. Christopher ( Doc Sab) Sabatino…. and I have been restoring classic Cadillacs over 20 years. I have built a reputation around the world restoring Caddy's such as these. You can go to my website and see some of my work www.CadillacWorld.net . I had promised myself, that there would come a day…where I’d actually keep one of my beauties when the time was right. At a time when I was "comfortable in life." Well, I had just finished a project (A 1960 Cad Conv’t) that went to NYC, when I decided the time had come for me to scour the country for a 1959 Cadillac Convertible that I would keep for myself. I searched everywhere. I looked on ebay. I checked hundreds of classified ads. I made tons of phone calls. I also took road trips and flew here and there.. all to no avail. I kept coming up with rusty cars that were all over priced..…I was contantly speaking to people in the know, in the Cadillac World, looking for the right car.…and I kept stressing to people that "I want to find MY CAR". Through relentless phone work I did get close. I did get one genuine lead. 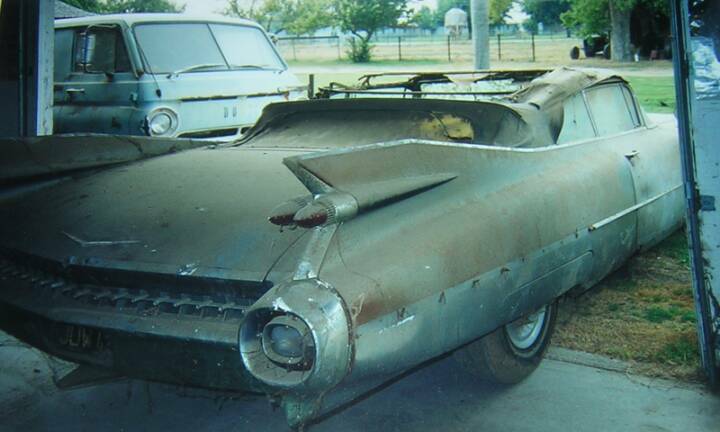 A Cadillac friend who was an acquaintance of mine, told me about a totally rust free 59 Cad convertible, that had been thoroughly disassembled. I begged the man to please give me the address and phone number. He didn't do so, I later learned, because he wanted to earn between $5,000 and $10,000 for the referral. The acquaintance was stretched so far financially at that time, that he himself could not afford to buy the car...... so that car slipped through my fingers. Some many months later after an exhaustive search.... I was at The Pomona Swap Meet and I was again searching for my 1959 Cadillac…when I bumped into another friend, who is in our car club…The "SKYSCRAPERS" International Car Club ( A club devoted to Classic Cadillacs…or any make classic car with a fin). I asked my friend "Tony H" not expecting a positive response, and Tony said he did know of a car…and that he would go home and locate the info and call me with it. He said it was a car that had zero rust. He said it was expensive, but was a car that was worth the money, as it had the Eldorado Tri-Carb motor. Three days later, Tony called with the information. I was overjoyed and called the number immediately. I went down to the then current, but unregistered 2nd owner, named "David S." Dave showed me the Cadillac. All of a sudden a bell went off in my head. This car was totally disassembled... just like the car that I was told about almost a year earlier. Could this be the same car??? I asked the owner if he knew this certain acquaintance... and he related that he in fact... did. I was floored, as this car was priced at $30,000, and it was $5,000 less than the car I was told about by the acquaintance. 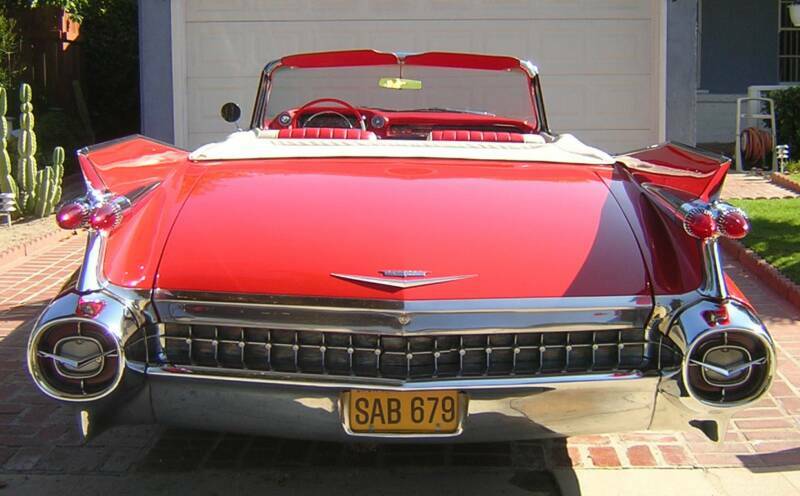 It was still pricey, but it was a rust free 1959 California Cadillac Convertible (Very rare and difficult to find) with many options. I purchased the Cadillac from David S. for $25,000, This was a savings of $10,000 from the initial price that the prior acquaintance that had disclosed to me months earlier. I called a tow truck and had it taken it to a body shop that I work with on a regular basis. I learned that the original owner owned this car from new. About 1970, the 1st owner put the car in his barn….and just left it there. It sat there about 29 years when David S. purchased it. It was the proverbial "BARN FIND. "An unmolested car, that had been sitting for years gathering dust and webs. David S. wanted to restore it. He took it apart….did many things…but it needed to be fully restored and assembled. It was literally... all apart and in boxes. The interior was in another city...also sitting in boxes at that location.. for almost 5 years. Dave owned this car about 5 years when he decided he had too many projects….and decided that it was time to part ways with this car... a decision he would later regret. Two months pass after I purchased the 59 Cad from Dave, and it was during that time period that I worked feverishly on the car. We did a complete restoration in record time. The car was now registered to me as the official second owner of record. The car was done...by just moments … and we were putting the finishing touches on it for a huge car show the following day. We were in my garage.... and it was the first night that MY 59 Cad was home in it's own proper garage space. The date was May 9th 2004. After many hours of arduous work during that day, I decided that I would read some of the old paper work. Leisurely, I flicked through the old registrations…and came across something that at first seemed out of place….when all of a sudden, I realized that what I was looking at was actually something written 2 1/2 years before I was born. When I initially saw what I read, I thought it was a filing system that my current DMV person had created as a filing system to identify me and my car... It was NOT a unique filing method.....you know... First half of your last name combined with the first 3 numbers of your phone number. HOWEVER, upon studying the paper work a moment longer, I discovered that what I was looking at was actually the receipt from the Automobile Club of Southern California for fees paid to register the car…dated May 9th 1959. It was the day that the very first license plates were assigned to the car. IT WAS THE DAY THE CAR WAS OFFICIALLY BORN.. AND REGISTERED FOR STREET USE. .. and TODAY was ALSO MAY 9th. SO... this car was completely restored and finished... exactly on it's 45th anniversar! This happen stance was totally by accident, and thoroughly unplanned. To top it off.. this paper work that I was looking at, was completed 2. 5 years before I was born. When I looked at the plate number that was assigned to my Cad…..I lost my breath…and almost lost my balance….It couldn’t be true…too much of a coincidence…how could it be???? The first license plate said … "SAB 679". Remember, my name is Sabatino….and THROUGH OUT my WHOLE life…people have called me by my nick name… "SAB". This is a coincidence that I thought was pretty amazing all by itself…and felt that it was one of those coincidences that happens from time to time, But…..what knocks it out of the park and into the outer limits, was that the license plates numbers "679" …are also the first 3 numbers of my CURRENT phone number. How could that be??? How could a plate have your name and phone number on it... by sheer accident? They didn't have vanity plates or personalized plates back in the 50's. Getting such a configuration, now or then, on purpose... would've been impossible... as the state doesn't allow 3 letters and 3 numbers on vanity plates... as they mimic old plate configurations, and vanity plates are not allowed to be ordered in that old configuration. With this rationale, MY HAIRS STOOD UP and I GOT GOOSE BUMPS..... especially when I put all the connections together. I relive the same feelings and sensations every time I relate this story to people... but the fact that the car was fully restored and reborn on the exact 45th anniversary of it’s first day on the road, further blew my mind. Mathematically, how many SAB prefixes of a last name are there in all the phone books of America? Probably a large number. Now let's narrow it down.... How many are in California?....And remember... that person would HAVE to live in Studio City California!! We've now reduced that number to a very small fraction of the original starting number. NOW, how many SAB's in Studio City would be a Cadillac FREAK? Reduce that number dramatically further still.... AND, of the remaining number, how many SAB's that live in Studio City... that were Cadillac Freaks... would also have my phone prefix... 679???? Can't be anyone else but ME. So, when you combine all of these elements and incorporate the math and the probability of such an occurence…and then factor in the time line, you realize that there are just to many weird and uncanny coincidences going on all at the same time. These facts, compounded by mathematical probabilities, FORCE me to believe that this car was PREORDAINED to be mine….two and a half years before I was born! What's funny, is that I wasn't even a licensed driver when this car was placed in that barn. I hadn't even moved to California when this car was already hibernating about 15 years. When I moved out to California, to go to Chiropractic College, in Dec 1985, it would be many years to come before I would actually be able afford and purchase a car of this value. To top it off, the timing of this car becoming available to me at the exact time in my life that I could afford it... just tells me one thing....MY RED 59 CADILLAC PICKED ME... and WAITED FOR ME! IT'S FINALLY HOME... and I wonder what it has planned for me in our future together. FRESH OUT OF THE BARN... AFTER SLEEPING ABOUT 30 YEARS.... NOTICE THAT THE TAGS ON THE CAR ARE NOT THE ORIGINALS... AND HENCE... ALMOST KNOCKED ME OUT W HEN THE ACTUAL ORIGINAL PLATE NUMBER WAS DISCOVERED IN THE ORIGINAL PAPERWORK.